Lovely lounge and dining room with door to patio. Luxury fitted kitchen with ceramic hob, oven, extract unit and fitted dishwasher. Beautiful modern bathroom with bath and power shower and WC. Pretty double bedroom with double bed with pocket sprung mattress. Outside - patio with garden furniture and small lawn. It is an ideal cottage for couples who want a peaceful break in an idyllic setting. The Coach House is situated on level ground with all accommodation on the ground floor and a separate car park space outside. It is convenient for people who cannot walk great distances or climb stairs. From the Coach House to the rail halt is only a short walk for those who wish to experience the beauty of the Looe Valley Railway Line. 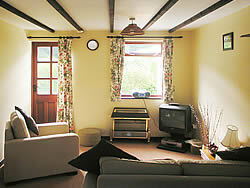 The tariff for the Coach House ranges from £150 per week in low season to £375 per week in high season.